Reliable performance and durable construction make the CKT unmatched in value for industrial weighing. Ideal for many applications, the CKT quickly accomplishes basic weighing, parts counting, and checkweighing, which helps users meet company and regulatory guidelines. 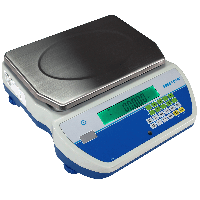 Repetitive weighing tasks are fast, with a backlit display that changes colours to show if a sample is under, over, or within the preset limits. The compact design is ideal for limited workspaces or when multiple scales are not an option. A short video tutorial to Adam Equipment's new Cruiser CKT bench checkweighing scale. The Cruiser checkweighing scale is ideal for checkweighing the weight of crates, boxes and tools in warehouse and light-industrial environments.